Every kWh produced with PV in New England effectively offsets three kWh produced and distributed by our 30% efficient conventional power supply and grid. For a number of important reasons, we do almost all of our solar jobs using SunPower equipment. An important part of Rob’s attendance at the conference was to see if we can find a low cost alternative (for a few situations where we absolutely must go for lowest cost) produced by a company with whom we share some values and which has an absolute commitment to quality. Rob was impressed by one, a Chinese company called ReneSola. He spoke to ReneSola representatives at length. 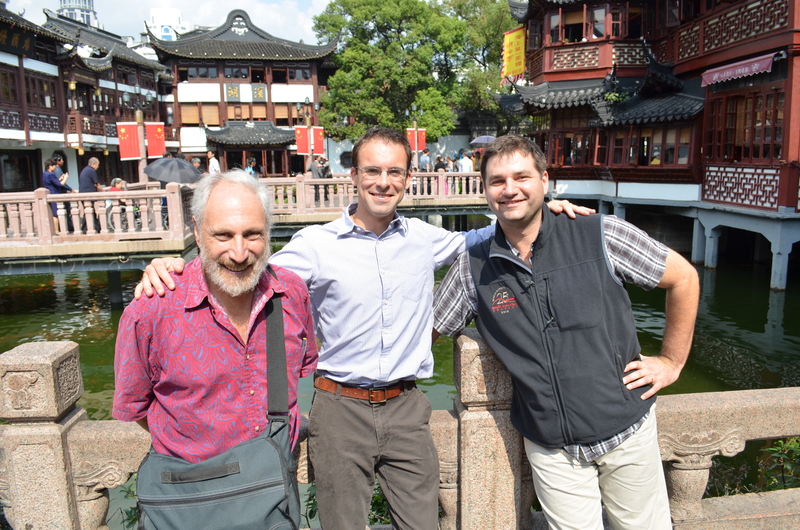 After his return they contacted him and offered an all expenses paid trip to Shanghai for Rob and two colleagues. Although it’s easy to jump on the bandwagon and say that we are not interested in doing business with Chinese companies, there are few solar product choices these days that don’t have some connection to Chinese manufacturing. Not wanting to preclude any future product options based on adherence to principles that may be too limiting, Rob, Ryan Bushey, and Mike Drezner accepted the offer. I wanted to go too, but couldn’t clear the decks enough to make the trip. They left for Shanghai on a Sunday and returned seven days later after a whirlwind. They were grateful to have the opportunity to witness the solar manufacturing process first hand and appreciative of the graciousness of their hosts. But they were only marginally impressed by the ReneSola product. 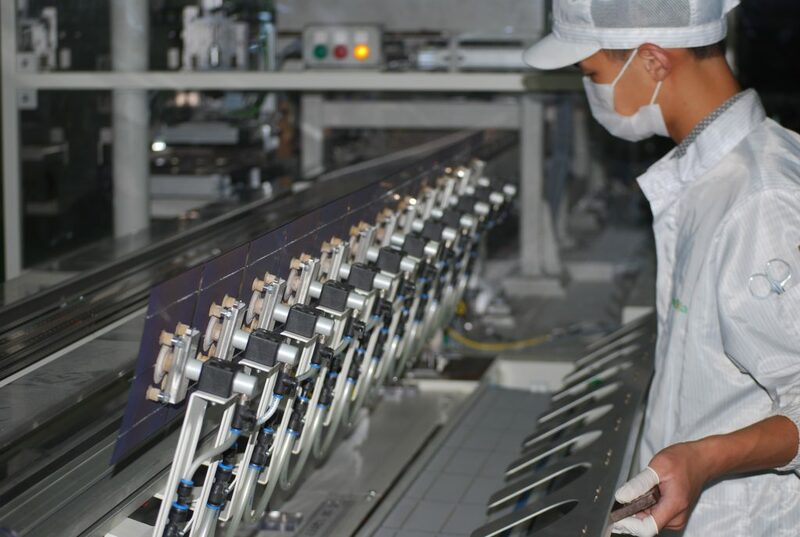 As a producer and supplier of wafers and cells – base components used in the manufacturing of the panels – they may have an edge over other Chinese companies that buy these components, but the panels are still 33% less efficient than the SunPower equipment we prefer to install. A week after their return Rob and the others did a slide show for SMCo employees. Clearly they were deeply affected by the combined genius and madness of modern day China. They were wowed by the pace of construction and development, of course. The billboards with advertisements for the Evergrowing Bank (that’s China! ), injection molding equipment, and other manufacturing hardware demonstrated that business to business marketing is paramount. 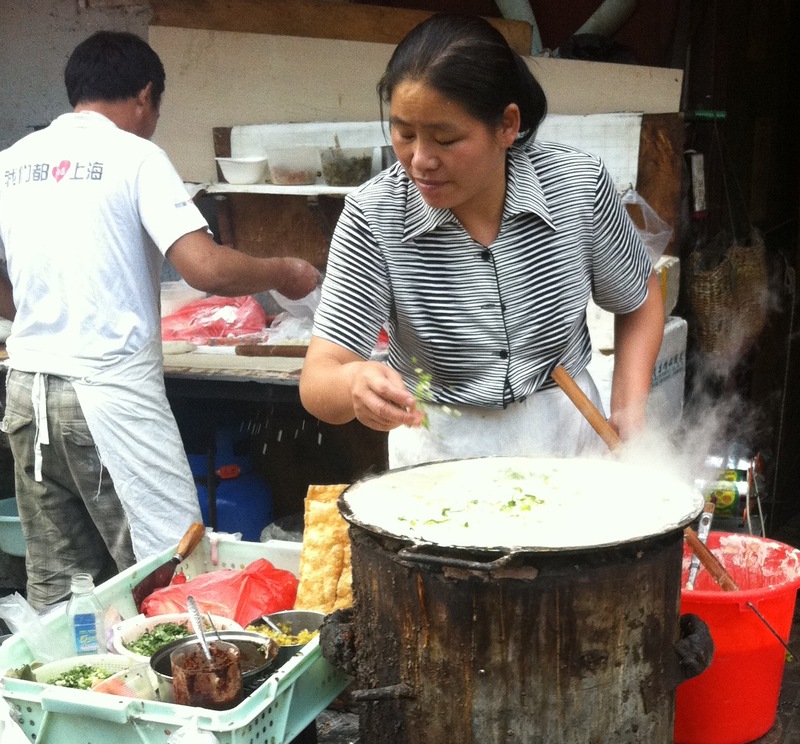 The slogan “billions and billions served” has a very different meaning in China. But most of their pictures, when you got right down to it, were of food. And food adventures. They liked the street food in back alleys the best. Rob, as many of you know, is gregarious, to say the least. Before too long he was standing behind a pushcart with an old Chinese guy making won tons. It was a worthwhile trip. We have a better understanding of the solar manufacturing process, and a better basis for comparison, but the most useful thing to come from the trip may be the development of Rob’s won ton skills. There may be a South Mountain dim sum restaurant in our future! They came back weary and worn out. 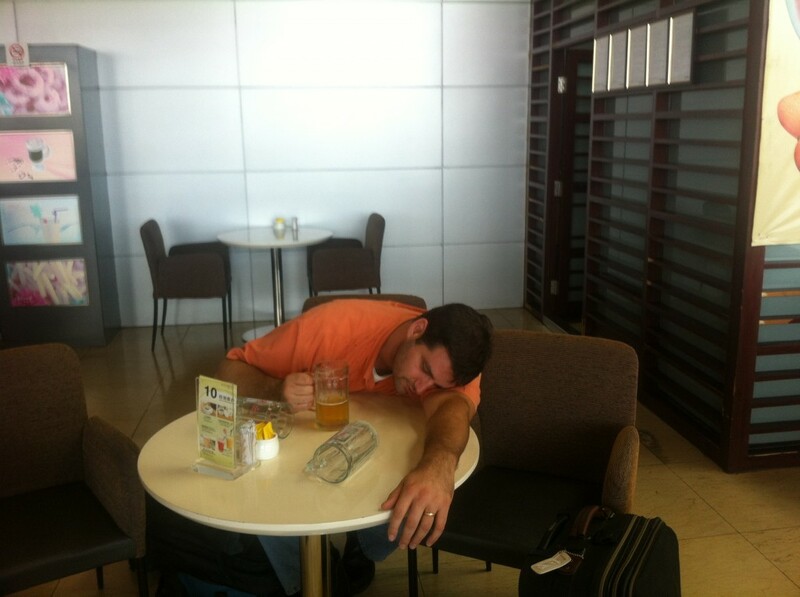 Here’s the fearless leader himself barely able to nurse a Tsingtao. But by the time they got back to work they were smiling again. And feisty as ever, but perhaps sobered by the implications of the current path of the Asian giant – for all of us. Great entry about solar PV. Your point about the number of jobs in solar currently (100,000), the growth rate of 116% in the past year and that Solyndra is just one failure in huge pool of success stories is a welcome antidote to the fossil fuel crowd. When will we end the thinking that energy must come from BURNING SOMETHING? As Thanksgiving is coming up, I would point out that original native americans who taught the english to grow corn to survive would be appalled that we now grow it, just to burn it. With the caveat that solar PV is not my strength, I would like to suggest that you may be using the wrong metric to evaluate the choice of PV panels. You mention that the Sunpower Panels are 33% more efficient that the ReneSola panels. I assume that you are measureing Watts/square foot of panel here. While there are instances where the number of square feet available for panels is limited, I suspect that is the exception rather than the rule. The largest hurdle that PV faces is not a lack of availble space, but the watts produced/dollar spent on equipment. I would suggest a Watts/installed dollar is a perhaps a more important measure of a panel’s efficiency. Keep doing what you do. It is an inspiration to many of us. I’m really enjoying the design and layout of your site. It’s a very easy on the eyes which makes it much more enjoyable for me to come here and visit more often. Did you hire out a developer to create your theme? Great work! Hello there! This is my 1st comment here so I just wanted to give a quick shout out and say I really enjoy reading through your articles. Can you recommend any other blogs/websites/forums that go over the same subjects? Thanks for your time! Rob Meyers, our energy services manager, says, “Thanks for your comment, David, and sorry for the delayed response; your comment was stuck in a spam filter until last week.